If you think about changing to a new Android phone, Samsung Galaxy S9 is a good choice. It is the first model equipped with Snapdragon 845 processor, which uses 8 core architecture and it is said to be improved ten nanometer process. Samsung Galaxy S9 attracts people's attention and there are many users, no matter Android users or iPhone users, have an overwhelming urge to give it a try. What we can do to move all our important and private data from our old phone to the new Samsung Galaxy S9/S9+? Are you looking for the fastest and easiest way to transfer data from old Android phone or iPhone to Galaxy S9? It doesn't have to be that hard. Here are two simple and secure ways to help you transfer data to Samsung Galaxy S9. Coolmuster Mobile Transfer (with its Mac version) is the most ideal transferring tool to transfer data from an old phone, both Android and iPhone, to Samsung Galaxy S9 with one click. First of all, this program supports to copy almost everything, including contacts, SMS, photos, videos, books, call logs, music, apps, etc., Secondly, it is easy to use and you need only 3 simple steps to transfer everything simultaneously. More importantly, it is compatible with all popular mobile phones, including the latest Samsung S9/S9+. Download the Phone to Phone Transfer on your computer and next we will show you how to use it to transfer data from old Android phone or old iPhone to new Samsung Galaxy S9/S9 Plus. Launch the Phone to Phone Transfer on the computer and you will see its primary interface as follows. Link your old phone and new Galaxy S9 to the computer via two USB cables. Phone to Phone Transfer will detect the two phones and show all the transferable content in the middle. Tick off everything you want to transfer. Then, click "Start Transfer" button to move them all to your new Samsung Galaxy S9. Samsung users must know the Samsung Smart Switch, which is introduced by Samsung and specially used to switch from Android, iOS, BlackBerry and Windows mobile phones to Samsung smartphone in one seamless move. It provides users with 3 different ways: via USB cable, Wi-Fi or computer. You can choose the way you like and here, we would like to show you how to how to transfer old phone data to Galaxy S9 with the wireless transfer provided by Samsung Smart Switch. Step 1: Go to Google Play store or Samsung store to download the latest version of Smart Switch app on your Samsung S9. Install and launch it. Then, give the app access to all your data on S9. Step 2: Choose "Wireless" > "Receive" and you will be asked to select your old phone model. > If your old phone is Android device, you need to download Smart Switch app on the old device. Put the old phone and new Galaxy S9 as close as possible and launch the app on both devices. On the old Android phone, tap Wireless > Send > Connect, and it will search for the new Galaxy S9 automatically. Or you can connect to S9 via the PIN code shown on the phone screen. After that, you can choose the files you want to transfer now. Both the two apps support Windows and Mac OSes. But their supported data types are not exactly same. 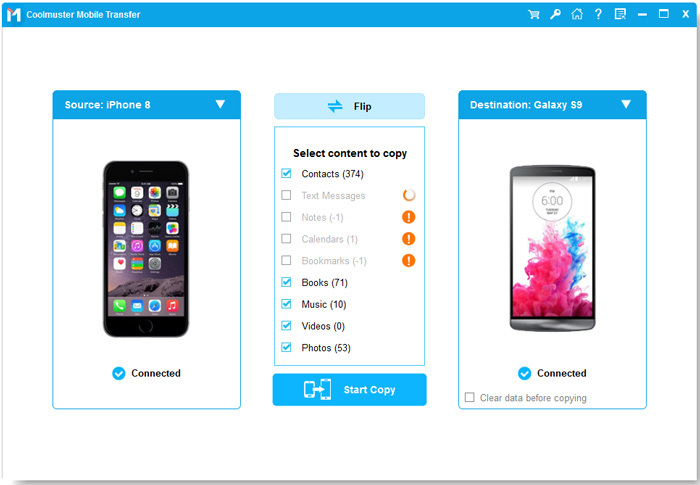 Moreover, Phone to Phone Transfer is able to transfer data from iOS to Android, Android to Android, iOS to iOS, Android to iOS, while Samsung Smart Switch only supports iOS/Android to Samsung transfer. Therefore, To my point of view, Phone to Phone Transfer is superior to Smart Switch.